Scientists Wait To See If Probe Successfully Landed On Mars : The Two-Way The Schiaparelli probe was supposed to make a six-minute descent through the red planet's atmosphere and make a controlled landing on the surface. Scientists are waiting for word. A visualization shows what the European Space Agency hopes Schiaparelli's Mars landing looks like. The probe will be making its six-minute descent through the atmosphere on Wednesday. After a seven-month voyage through space and a three-day cruise to approach Mars, the European Space Agency's Schiaparelli lander is getting ready for the final leg of its journey: a six-minute trip through the red planet's atmosphere. It's the make-it-or-crash-land-it moment for the probe, which is designed to collect data on Mars' atmosphere and dust storms. If it succeeds, it would be Europe's first successful Mars landing. Schiaparelli was expected to enter the atmosphere at 10:42 a.m. ET on Wednesday and make its landing at 10:48. "It may take some hours to get official confirmation that Schiaparelli has landed on the Red Planet," the ESA says. In the best-case scenario, we wouldn't know what happened right away. It takes 10 minutes for signals to travel between Mars and Earth, and observing the success or failure of the landing will be complicated. There's a cooperative international "listening in" campaign, the ESA says, with multiple countries maneuvering their telescopes and satellites to try to pick up data about Schiaparelli's landing. A telescope in India was attempting to catch a "very faint signal" straight from the lander to Earth for the earliest possible updates, ESA says. Those would be in real-time (with the 10-minute delay). No signal was picked up, which wasn't a total surprise — and doesn't necessarily signal failure. Now ESA's Mars Express spacecraft, which has been orbiting Mars for more than a decade, will offer the second chance at a signal from Schiaparelli. But the spacecraft can't listen to Schiaparelli and talk to Earth at the same time, so it will take approximately an hour and a half after landing for that data to reach scientists. 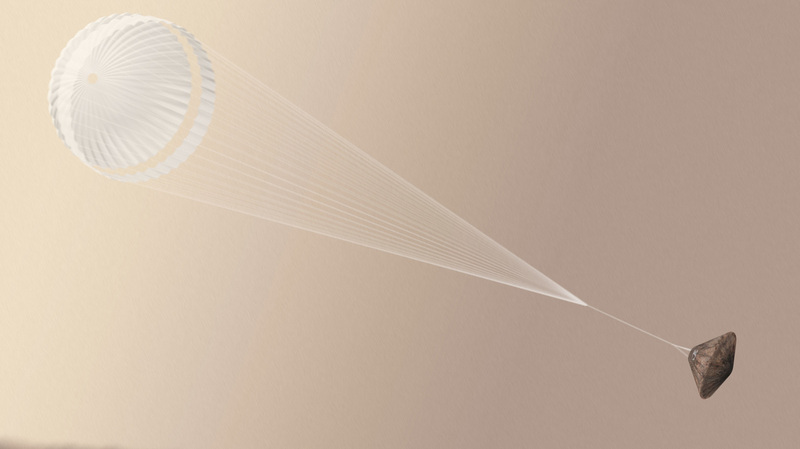 Several hours after the landing, scientists will have information from NASA's Mars Reconnaissance Orbiter, which will open a two-way connection with Schiaparelli when it flies overhead and sends that information back to scientists. Finally, there's Schiaparelli's space-travel buddy, the Trace Gas Orbiter, which the probe separated from three days ago. The TGO will be busy entering orbit Wednesday, but once it's finished with that, it will collect detailed information from Schiaparelli and beam it back to Earth. That should be available on Thursday. If you'd rather not wait for the dispatch from reality, you could always watch the best-case scenario in animated form: ESA released a real-time visualization of what the landing should, ideally, look like. As NPR reported earlier this week, landing on Mars is a notoriously tricky proposition — the history of space exploration includes a long list of Mars-landing failures. "No other country besides the U.S. has operated a probe on the surface," NPR's Rae Ellen Bichell notes. "To complicate things, NASA has forecast possible planetwide dust storms." The Schiaparelli probe is named after an Italian astronomer famous for mapping the surface of Mars. Along with the more prosaically named Trace Gas Orbiter, it's part of the ExoMars program, a joint operation between ESA and Russia's space agency. As Rae reports, Schiaparelli "will collect information about things like wind, humidity and electrical fields for as long as its batteries last — probably just a few days." The next phase in the program is a 2020 mission to deliver a rover to Mars.